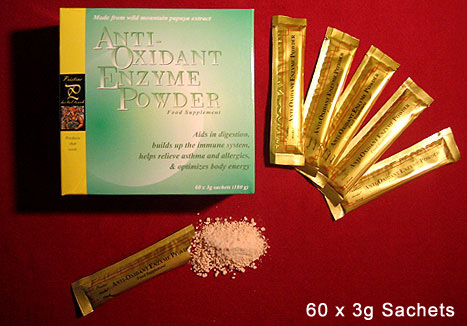 Anti-Oxidant-Enzyme.com - Wild Mountain Papaya, An All Natural Anti-Oxidant Enzyme Powder! Suffering from colds, flu, or viruses like HPV (warts)? Fermented Wild Mountain Papaya Extract is recommended by Doctors all over Europe, including Dr Montagnier, who co-discovered the Aids virus. Dr Montagnier prescribed the Papaya treatment for Pope John Paul II. Read the full story here. Pope John Paul II receives fruit treatment from Prof. Luc Montagnier, co-discoverer of AIDS virus. © Pristine Enterprises, Inc. All Rights Reserved.